It is true that it would cost more to spray foam insulate a home when compared to using the traditional fiberglass insulation. Yet, the benefits far outweigh the initial installation expenses as the year-on-year returns quickly add up. In fact, using the air-tight and energy-efficient spray foam insulating system is hardly a choice any more, it’s a necessity. Hundreds of architects, builders and property owners have benefited from managing with smaller HVAC system requirements, lower energy bills and a healthier indoor living or working environment. Nonetheless, you must have an idea of the type of investment you are expected to make. So what is the average cost of spray foam insulating a home? At $0.44 to $0.65 per foot board, open cell spray foam costs less than the closed-cell type which is roughly $0.70 to $1 per board. Although it is a good choice where sound reduction is required, R-value is lower and hence, a thicker layer might be required. More expensive closed-cell spray foam, on the other hand, has added advantages. Not only does it provide high energy efficiency but it also enhances the structural integrity of your building. Whole house insulation costs are likely to be more than attic/basement insulation costs or that of a new addition. Square footage naturally plays a big role in determining price. 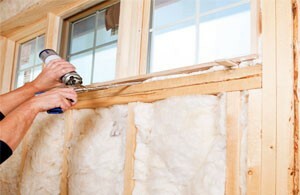 Filing an empty wall is also different from insulating a roof cavity. At Platinum Wall Spray Foam, we provide a detailed estimate for your project to eliminate any surprises later. The average costs to spray foam insulate a home in Central Ontario would certainly differ from one further north or south. Price of materials and labour also vary for different regions. For instance, a manufacturer-trained technician is likely to charge a little more than an inexperienced one. We would caution you against hiring just any contractor; spray foam insulation must be installed by a trained and experienced professional. Don’t let the cost of spray foam insulation prevent you from investing in its premium protection. It lasts for years, which means you will enjoy a lifetime of benefits. To learn more about the cost of spray foam insulating your home, call Platinum Spray Foam at (416) 731-8600 or request an estimate online.